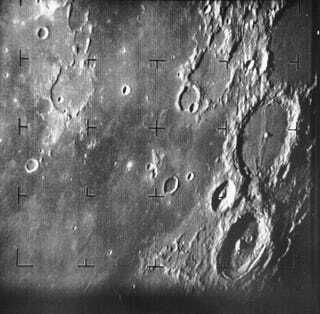 Fifty years ago exactly today, we got our first up close shot of the surface of the Moon as Ranger 7 beamed back this shot to show us what it could see. The pictures were meant to be a precursor to exploration, as NASA searched out potential landing sites for the Apollo missions. But this picture isn't just cool as a historical artifact, it's also a way to think about where we are with space exploration today. It's fascinating to watch a similar process unspool now, as we circle closer and closer to Mars, first marveling at the odd (and occasionally all too familiar) landscapes we see in photos, then speculating about just what the geological features that we see might mean, and, all the while getting closer to landing a person there. It's not hard to imagine, 50 years from now, that people will be looking at our early footage of Mars as just the first few in a series of steps that eventually brought us to its surface — and looking forward to the next destination ahead.